The SSFL community applauds ATSDR’s decision to reject a petition calling for repudiation of past health studies and weakened cleanup. The agency’s announcement comes after months of public outcry over its prior decision to accept the petition, which was submitted by a former manager at SSFL and current consultant to the Department of Energy, which is one of the polluters at SSFL. NBC4 has revealed new information about contamination from SSFL that has migrated to the Brandeis-Bardin Institute in “LA’s Nuclear Secret: Camp Cover-Up, “which aired on November 9 and was followed up with a segment on November 19. The investigation is part of NBC4’s blockbuster year-long investigation, “LA’s Nuclear Secret” that was broadcast in September. New Petition – Tell ATSDR to Stay Out of SSFL! The SSFL cleanup is again at risk, this time from the federal Agency for Toxic Substances and Disease Registry (ATSDR) which recently announced that it had accepted a petition which had asked it to repudiate past studies that showed potential health risks from SSFL and to weigh in against the current cleanup agreements. ATSDR is not planning to do any new testing for contamination or new research on health problems in the community. It is highly inappropriate for the feds to try to undo either the past studies or the cleanup commitments. 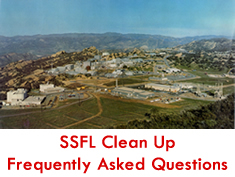 Sign the Petition to Make Sure that All of the Nuclear and Chemical Contamination at SSFL is Fully Cleaned Up! Some of the parties responsible for the contamination are pushing to not have to clean up the great majority of the contaminated soil. This is unacceptable. It would leave all who live in the area around the polluted lab at risk from radioactivity and other toxic materials migrating off the hill. Sign a petition to elected officials asking them to ensure that the cleanup commitments are upheld and that ALL of the contamination is cleaned up! In August, the Agency for Toxic Substances and Disease Registry (ATSDR) announced that it had accepted a “citizen’s petition” to re-evaluate prior studies that found a connection between SSFL and health impacts and to provide an “opinion” about cleanup “options.” However, the petition was sent by a former SSFL official and DOE contractor who asks ATSDR to refute previous studies and weigh in against the cleanup agreement. ATSDR should stay out. SSFL must be cleaned up now so that local communities are no longer at risk. A tentative new 180 page water permit released by LARWQCB, if approved, would further relax the already weak pollution limits for Boeing and allow increased amounts of contaminants to migrate off SSFL in polluted runoff. A hearing for this permit is currently scheduled for February 12 at 1:30 pm. – please attend and speak out for a stronger permit. On January 5 the Sacramento Superior Court of California denied Boeing’s motion to summarily grant judgment for them and allow them to dispose of radioactive waste from dismantlement of contaminated SSFL buildings wherever they chose, and without getting approval from state agencies.